Winter weather can wreak havoc on your shoes and with the season now in full effect, it's important that we give our shoes a little extra care to avoid permanent stains, damage and even injury. Specialists in shoe care and repairs, international service retailer Mister Minit has been looking after Australia's shoes since 1955. In time for winter they are offering advice for looking after your shoes, putting emphasis on leather, suede and nubuck shoes. 'Leather soled shoes absorb moisture and wear extremely quickly in wet weather. Prolong the life of your shoes and keep your feet dry by adding a nonslip sole to all leather footwear," says Leigh Hunt, Mister Minit Technical Trainer. 'It's also important to replace your plastic heel tips with rubber non slip heels in order to prevent slipping on wet surfaces," Leigh says. Leigh also says that suede and nubuck shoes areone of the most common types of footwear in winter due to their warming properties, but are more prone to damage and require specific care to ensure their longevity. 'Ensure your leather and suede shoes are protected from wet weather by using water and stain protector. If stains do occur on suede and nubuck shoes, use Mister Minit's Suede and Nubuck Cleaner and brush to help lift off dirt. Ensure suede is laying in the same direction and brush from the toe to the back of the shoe to lift the nap of the suede. Continue to waterproof on a regular basis to protect from dirt, grime, spills and stains," she says. If you don't want to do it all yourself, Mister Minit has just launched a new Shoe Revival Package, which is an instore service where Mister Minit will clean, buff, polish, deodorise, and waterproof your shoes on site for only $14.90 stand-a-lone, or $9.90 with any other service. To help get your shoes through winter in one piece, Mister Minit has answered some frequently asked questions for protecting your shoes this season. Q. What is the best way to protect my shoes from rain? A. The best way to protect shoes and boots from rain is to treat them with Mister Minit Water and Stain Protector prior to initial wear to guard against grime and watermarks, and then every few weeks thereafter. Clean dirt first with Mister Minit Easy Cleaner, and then protect shoes and boots with Mister Minit Leather Conditioner - this will keep leather soft, waterproof and restore lustre. 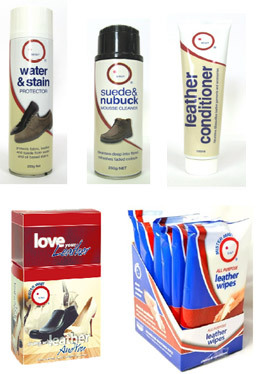 There are a great range of products available for all protecting a range of leather materials. Look out for Ugg Boot Protector to prevent stains. Q. If my shoes do get wet, what is the best thing to do? A. Let shoes dry naturally at room temperature away from heat or direct sun. Pack them out with newspaper which will help draw out moisture inside the shoe. Once shoes have dried, the leather maybe become stiff; replace moisture with a leather conditioner. Q. I've just splurged on a beautiful new pair of shoes. How will I get the most out of them this winter? A. Protect your original sole with a Mister Minit Anti-slip Sole, which will prevent the original sole from losing its shape and prolong the life of the shoe. Apply water and stain protector to waterproof and avoid stains. Q. I love suede shoes but am worried about the upkeep, do you have any suggestions? A. Apply a suede and nubuck cleaner to clear stains and dirt first. Suede brushes will lift dirt off the suede and ensure suede is laying in the same direction. Brush from the toe to the back of the shoe to lift the nap of the suede. Try to prevent the stains in the first place by protecting with Mister Minit Water and Stain Protector on a regular basis. Clean and polish weekly and use a leather conditioner every 6-8 wears to nourish the leather. Repair worn down heels early so you prevent injury and don't damage the heel block. Add a savour sole to new shoes to protect the soles and make shoes last longer. Waterproof shoes on a regular basis to protect from wet weather and stains. For suede shoes, use Mister Minit Suede and Nubuck Cleaner and a suede brush to help lift off dirt. If your shoes get wet, dry at room temperature rather than in the sun or in front of the heater. When storing boots for winter, use a blow up booty shaper or a boot tree to maintain shape. Use Mister Minit Love Your Leather Kits to clean and maintain your shoes on an ongoing basis. For repairs and advice, visit one of Mister Minit's 230 stores across Australia and New Zealand. All shoe repairs have a six month wear and workmanship guarantee. For information and store locations visit www.misterminit.com.au.